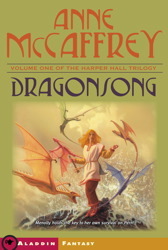 I have to confess that I have not read much fantasy; but having confessed that fact, I also have to state that I love the dragon books by Anne McCaffrey, and so I was very sad to read of her death last week, at age 85, of a massive stroke. I read her Harper Hall trilogy (Dragonsong, Dragonsinger, and Dragon Drums) back in high school, on the recommendation of my cousin and fell in love with the books and the planet of Pern. I didn't want to be a dragonrider, I wanted to be a harper and study at Harper Hall. I did go on to read many of the other Pern books, and while none of them caught my attention the way that the Harper Hall trilogy did, I found all of them to be engaging and entertaining. I think that what captured me most was her ability to make Pern such a real place. When I am reading one of her books, Pern is more real to me than the world around me. Her books are also responsible for my love of dragons, for in her books, they are the "good guys", fighting to save the planet from devastation. Because of this, whenever dragons appear in any other book, I am always rooting for the dragons and the humans belonging to the dragons. In an ironic twist, I have spent the past week re-visiting the Harper Hall books, so I was deep in Pernese life when I learned of the author's death. I have now picked up The Masterharper of Pern, a book that has been on my shelves for at least 10 years and that I was sure that I had read; and yet 100 pages it, it is not striking any chords in my memory. And so I am enjoying a new (to me) tale from Pern and the Harper Hall. These are books that I hope never get made into movies. I can't imagine that any director's rendition of Pern could live up to the vividness of the writing, and my own imagination!